For the place in Virginia, USA, see Cumnor, Virginia. 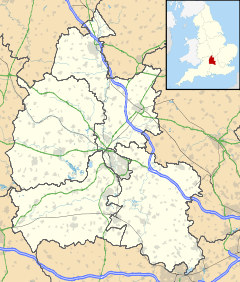 Cumnor is a village and civil parish 3.5 miles (5.6 km) west of the centre of Oxford, England. The parish of Cumnor includes Cumnor Hill, (a ribbon development between Cumnor village and Botley), Chawley (at the top of Cumnor Hill), the Dean Court area on the edge of Botley and the outlying settlements of Chilswell, Farmoor, Filchampstead and Swinford. The parish was part of Berkshire until the 1974 local government boundary changes transferred it to Oxfordshire. The village is about 2 miles (3.2 km) southwest of Botley and its centre is west of the A420 road to Swindon. Cumnor has two public houses, the Vine and the Bear and Ragged Staff. It also has a butcher, a hairdresser, a post office/greengrocery and a complementary health clinic. The newsagent closed in 2018. There are three churches: the Church of England parish church of Saint Michael in the centre of the village, Cumnor United Reformed Church in Leys Road and Living Stones Christian Fellowship that meets in the Primary School. The Bear and Ragged Staff public house. The village has football and cricket clubs, both located on Appleton Road. Cumnor Primary School has produced many distinguished pupils who have attended schools such as Matthew Arnold School, Abingdon School, Magdalen College School, Oxford High School for Girls, Our Lady's Abingdon and the School of St Helen and St Katharine in Abingdon. The Oxford School of Music is based in Cumnor Hill. Notable residents, as of October 2008, included novelist Philip Pullman and celebrity chef Sophie Grigson. The composer and conductor Christopher Whelen lived here for several years until his death in 1993. There are a number of bus services that operate in Cumnor connecting Cumnor to Oxford City Centre and other local towns. Stagecoach Gold route S9 operates up to every 30 minutes during the day and provides links to Wantage and Oxford. Routes 4 and 4B also run every 30 minutes and link Cumnor with Abingdon and Oxford. Cumnor was first mentioned in 931 as Cumanoran. The name is of Old English origin, and appears to mean 'Hillside of a man named Cuma'. In Saxon and medieval times the parish was one of the largest in Berkshire, and included Wytham, Seacourt, North Hinksey, South Hinksey and Wootton. The parish was one of many in the Hundred of Hormer. In 1560 Cumnor Place was the scene of the accidental death and rumored suicide or murder of Amy Robsart, the ailing wife of Lord Robert Dudley. The house was pulled down in 1810, because, it is said, her ghost gave the locals so much trouble. In reality, the ancient house had become decrepit. Cumnor is the basis for Lumsdon in Thomas Hardy's novel Jude the Obscure. Cumnor contains a number of houses by Clough Williams-Ellis, the architect most famous for his designs for Portmeirion. The Cumnor houses represent some of his earliest commissions, including his first commission, Larkbeare (1903–04, completed 1907) on Cumnor Hill, designed whilst he was still a student at the Architectural Association School of Architecture. The other examples are Cutts End House (1911, Appleton Road), Hurstcote (1922, Appleton Road), and Larkbeare Cottage (1910, Cumnor Hill; originally a gardener's cottage associated with Larkbeare). He also designed Cumnor Rise Hospital at a similar time to Larkbeare (designed 1903–04, completed 1907) but this was demolished in the 1990s. ^ "Area: Cumnor CP (Parish): Parish Headcounts". Neighbourhood Statistics. Office for National Statistics. Retrieved 23 March 2010. ^ John Cornwell (24 October 2004). "Some enchanted author". Some enchanted author. The Times Online. Retrieved 6 January 2010. ^ Sophie Grigson (1 March 2007). "Sophie's Guide to the World of Vegetables". The Oxford Times "Weekend". Retrieved 6 January 2010. ^ "Cumnor Place (Cumnor Hall) (Dudley Castle)". The DiCamillo Companion. Mills, A.D.; Room, A. (2003). A Dictionary of British Place-Names. Oxford: Oxford University Press. p. not stated. ISBN 0-19-852758-6. Page, W.H. ; Ditchfield, P.H., eds. (1924). A History of the County of Berkshire, Volume 4. Victoria County History. pp. 398–405. Pevsner, Nikolaus (1966). Berkshire. The Buildings of England. Harmondsworth: Penguin Books. pp. 124–126. Wikimedia Commons has media related to Cumnor. This page was last edited on 5 July 2018, at 08:58 (UTC).